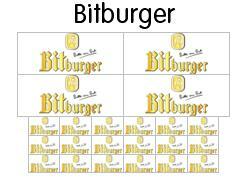 Decal- /sticker set of beer brand Bitburger. The set contains 4 large (brick 1 1/3 x 4) and 18 small decals (brick 1x2). Nearly invisible transparent layer through water based process. Decals have to be cut, but cutting lines are indicated. Because of the transparent layer, you get the best results on a background with a light colour (for instance white, light gray, tan). The best eCommerce software by ShopFactory powers P53. All-in one eCommerce and shopping cart software.